Village East Apartments in Colorado is a beautifully landscaped garden community designed for your comfort and pleasure. Spacious 1 and 2 bedroom floor plans give you your choice of a one level apartment or a 2 story loft. 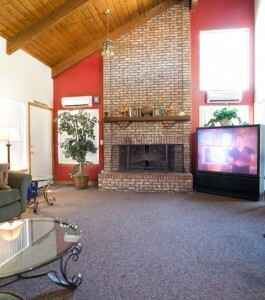 Located less than 5 minutes away from Peterson AFB, restaurants, entertainment, and shopping. Take time to visit Village East Apartments in Colorado. You’ll be glad you did. MOVE IN SPECIAL! $399 Moves you in! We recognize that pets are part of the family. Two pets per apartment home. We accept cats and dogs up to 60 lbs. The pet fee is $150.00 per cat and $150.00 per dog. The pet deposit is $150.00 per pet. There is an additional monthly pet rent of $25.00 for one pet and an additional $10.00 for the second pet. We are pet friendly however; we do not accept certain breeds of dogs to include: Pit Bulls, Bull Terriers, American Staffordshire Terriers, Rottweilers, Akita, Chow, Doberman, German Shepherd, Husky, Presa Canario, and Wolf Hybrid. Living is made easy when you reside at the Village East Apartment Homes. Step out onto your private balcony and take in the marvelous views of the Front Range. Only 5 minutes away from Peterson AFB, restaurants, entertainment, and shopping. Should you prefer a one level apartment home or a two story loft, Village East has the perfect home for you. Customize your apartment home with an accent wall color and choose between wood laminate flooring or berber carpet. Take time to relax and enjoy the sparkling pool and soothing hot tub.